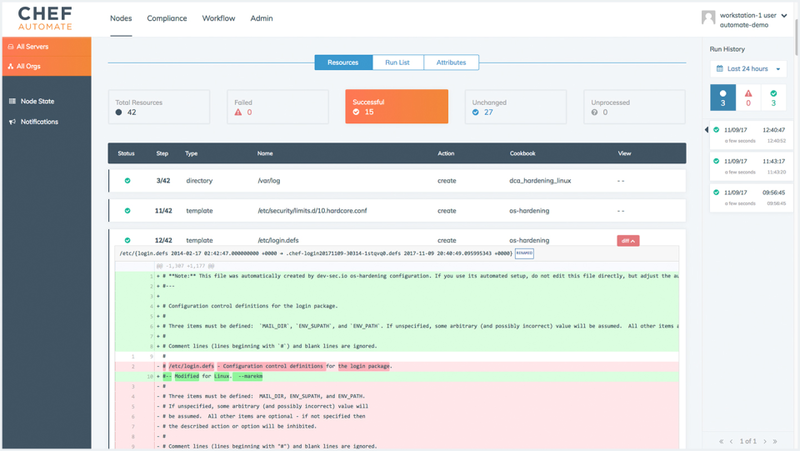 DevOps platform that automates infrastructure deployment via built-in validations, configuration testing, server data storage, etc. Pros: Chef is the configuration management tool. It helps in automation build, deploys and manages the CI pipeline and also provides the collaboration and makes clean and easy way for release. The Open Source code make it transparent and easy to debug and customize it. Chef is the best tool to pick form the CM DevOps option as it has the most features that need a CI pipeline need it at the time of development and delivery. Chef is highly scalable with high availability as backup master node is also there. Cons: Implementation is the most complex part. There should be wizards for the same to make it simple and easy. Master Node can be configured on linux only, So it makes it compulsory to know LINUX while setup of master node. ChefBook is not as easy as yaml scripting language. Overall: Chef is helping us to configure the build and deploy for the different server at the same time. Chef help us to implement the true DevOps environment for the development and product delivery. Chef - A DevOps Tool to manage your all configuration. Pros: Chef is a powerful configuration management tool that manages and helps in automating the infrastructure with the advance software methodology . It helps in managing the timeline for release. Chef also provide the template infrastructure to configure the module according to the enterprise and DevOps standard. It really helps in deploying the project with the automation. It is written in Ruby and Erlang which run so efficiently on servers without using the must resources. The DevOps methodology helps in making a streamline for configuration and maintenance. Cons: Implementation of Chef and opting the DevOps methodology is one of the complex part of it. Master Node can be only configurable in Linux\Unix platform. Learning curves are sharp but the brief documentation help and never let you stuck in any step. Overall: We manage the application and services so efficiently with it. The chef-solo also helps in learning and implementing the things. On production we use client/server mode to make it more productive. The elastic search indexing help the client node to handle the query in more efficient manner. A tool for automation of complete infrastructure. Pros: Chef is a complete automation tool which help us to build the efficient infrastructure of code. 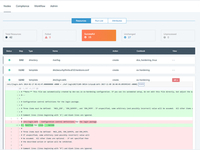 It also helps to simplify the configuration management, monitoring and deployment. The build in templates for cloud and on-premises help to setup the configuration. Integration with different cloud and OS make it dynamic to flexible. Chef is one of the best and easiest tool for configuration management. The event feed provide the one stop notification for our all configurations. 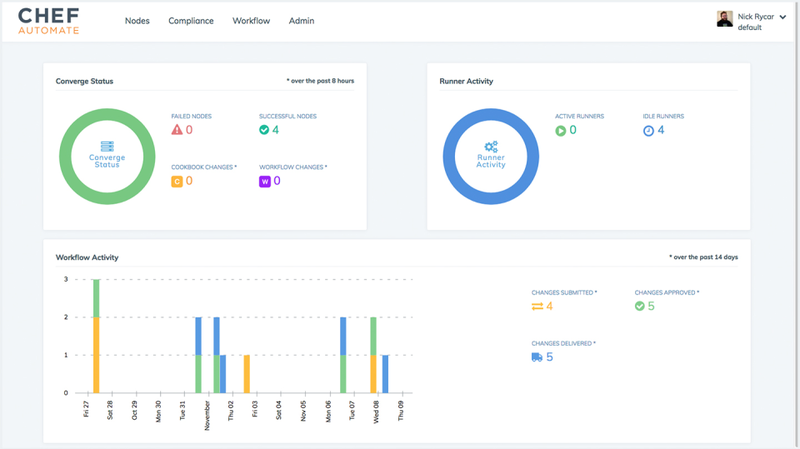 The customized compliance help to generate the reports for audits. Cons: Chef needs to provide the simple wizards to setup the master & client nodes for different environment. Documentation search engine should be more enhanced. Chef should also come with the PUSH configuration as it is always recommended in such case when our infrastructure is scaling to frequently. Overall: Chef is one of the best and simplest tool for configuration management and automation for code infrastructures. Chef made the deployment of 500+ hybrid environment of different projects which makes it simple with the help of automation. Pros: Chef is the one of the robust configuration management tool compared to the current market option. Chef is the DevOps engineers first choice as it is having a large community in the current dedicated market place. Highly scalability feature of the tool make it operation engineer first choice as it make possible to deploy the system with zero outage with the help of docker. Open source code provide the great transparency in the tool. Chef play a vital role in the DevOps software lifecycle as it manage the configuration and help to provide the automatic lifecycle. Cons: Installation process is bit tricky, specially at the time of configuring master server for it. Master server can be setup on Linux/Unix machine. Chef need code based knowledge for scripting the tool which make it little complex. Documentation is also very large it must come with and fast guide. Overall: We are using it in our production and Unit Test environment. The automation provide by the DevOps tool is really excellent. We have jump into the Chef Enterprise edition as it really helping us from so many years. Pros: We've been using Chef in production for 7 years now. As other technologies have entered into the scene, Chef has continued to evolve and keep up with the latest trends. It remains a solid choice for configuration management and infrastructure deployment, whether on virtual machines, or containers. 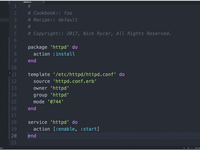 Cons: Templating language can be a bit hard to learn especially for those not already familiar with the Ruby programming language. Pros: Chef is the one of the highly popular tool for configuration management tool for DevOps practice. Deploying of 100s severs with a automation process with zero human error can be possible by chef. Many MNCs and other organization are jumping to devOps with help of Chef. Its highy scalable with high availability of it as its having the provision of backup master agent server. Its design to deploy, configure and manage servers. Source Code is also available of GIT as its open source software tool. Cons: Chef Master server can be configured to linux or unix, but client can be on wimdows also. Setup process is also lengthy then tool named Ansible. As it have to install for both master and client server to make it work. Overall: Chef is configuration management tool which is helping in automation of deployment process by which we doing the same task with less amount of time with zero errors as its completely follow automatic process. Pros: Chef is an open source tool for configuration management, focused on the developer side for its user base. Chef operates as a master-client model, with a separate workstation needed to control the master. It's based in Ruby, with pure Ruby used for most elements you write. 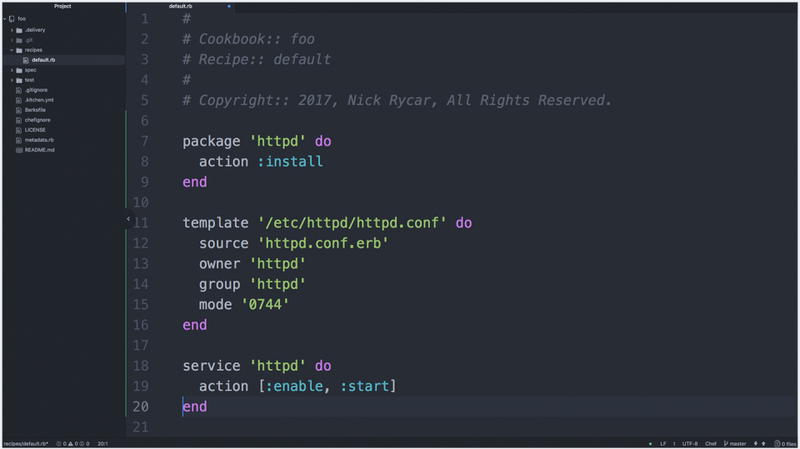 The Chef design is transparent and based on following the instructions it's given, which means that you'll have to make sure your instructions are clear.Chef is good for development-focused teams and environments. It's good for enterprises looking for a more mature solution for a heterogeneous environment. Cons: 1. The learning curve is steep if you're not already familiar with Ruby and procedural coding. 2. It's not a simple tool, which can lead to large code bases and complicated environments. 3. Doesn't support push functionality. Overall: We made our hardware infrastructure much easier to manage through chef. Great for building systems the way we want them to be. Pros: The best thing about Chef is that we can force servers to have the files we want on them with the content that we want and make sure that packages are installed/updated without much effort. Cons: If you decide a file/package should not be placed/installed on a server anymore you have to explicitly state that you want to remove it. Deciding not to install it is not enough. Also, the unit tests have a pretty steep learning curve. Pros: Chef is probably the best solution for enterprise configuration management. The language is very easy to use if you are familiar with Ruby and even if you are not the documentation is very easy to follow. Cons: It is very resource intensive to perform Chef runs so is not very suited to low capacity server or VPS's. So its more suited to large enterprise where there are sufficient resources available. Pros: Easy to implement, learn and use on daily basis for Configuration Management. Pros: Really liked that the ability that it allowed scaling to be done relatively easily and if I had any questions I got a response back quickly. Cons: Set up did take some time and using their API. No complaints other than that. They are also very friendly with support questions and answers. A good tool for management machine configurations and tracking infrastructure. Pros: Once you configure your CLI and learn your away around setting up cookbooks and environments, it is easy to check in on the state of your infrastructure and perform updates and actions across many machines. Cons: It can be difficult to track infrastructure as code if you have engineers making changes manually, and setting up permissions can be difficult at times. Gets the job done with a minimal amount of setup and commands. Pros: I like that I can configure an entire Oracle middleware environment within a matter of hours, instead of it taking days. This works well for our dev/qa/prod environments. Cons: Not very flexible with Windows configuration, there is also not a lot of documentation out there for specific Windows configurations. Pros: it helps in creating different nodes for different envronment and make runlist for each of them seaparately which makes configuration management easy. Cons: setting up the environment is difficult and gives many errors which can be avoided by bringing more automation to the process. Pros: good to register nodes, then install cookbook sfrom supermarket. ready to use cookbooks simoly deploy them on registered nodes. Cons: the architecture of chef server, chef client and chef nodes is difficult to understand for beginners ,Also it have lot of authentication access formalties for setup. Pros: Chef is widely used in industry and hence has very good documentation and support. It has been designed for programmers mindset, very convient to write instructions in ruby. It can scale to large environment without much issues. Cons: It has pull mechanism and schedules. Hence changes are not immediately observed. It has some learning curve. I found the setup is little bit complicated. chef allows me to download scripts/cookbook from supermarket and i can execute the, on specific nodes. Cons: Chef is a complicated software, though it have very huge capabilities but seting up chef architecture require great level of knowledge in devops . Pros: This tool has an amazing command line tool which is knife which makes it really easy to connect with different nodes and deploy the containers and files on them. It have really great client and server architecture. Many scripts are already available ready to use. Cons: Understanding the tool is tough call in the beginning but once we get the basic terminology and installation clear, this tool is a great fun to use. Pros: I love this software! Its so easy to use. The support team is always on par and able to help me out. 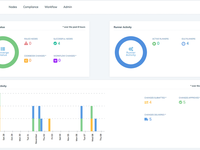 Pros: It has cloud configuration and automation, it includes management of security, you don't have to be a DevOps to use it, it has a world wide community. Eventhough it is Open Source is really stable, it offers analytics and reporting. Cons: It is some how difficult to learn so the initial configurations and process are a bit hard, the delivery process has to be as canonical as posible, its documentation is not in one single container, and it could be difficult to find and review. The main thing I liked about chef was that (as I am beginner), they have interactive tutorials. Pros: 1) Easy and user-friendly user interface. 2) Configurations are quite easy. Cons: 1) Some things from tutorial are missing like project can be used directly to create docker image and consequently container, later which can be used for chef-node. Overall: I used it for horizontal scalability in my project. I created dedicated webserver and database server using chef. Pros: the documentation is very good, I find a lot of informations there besides what is available in other places. Cons: I for my self hate that mac is not supported as I do have to work on mac from time to time, so you are tied to windows and linux only.